There is something about sequins that makes me feel happy. They are unignorable, sparkly, and girly and I think all of these things are particulary appealing to my mood at the moment. Currently I'm bored of bland. A week ago I was only black and white. Go figure. Sorry for being such a bad weekend blogger! It was my roommate's 20th birthday and my best friend was also in town. Sometimes life's beauties get in the way of blogging. Wearing: f21 sequin top; bb dakota skirt. That shirt and skirt are the prefect combination, you look gorgeous! I came across your blog and very much enjoyed. Please come and visit mine too! It's a fashion blog with outfits and blurbs inspired by Portobello Road, London. I love your style! And I'm obsessed with sequins too, they just make a simple outfit look so chic! And these pictures in the snow are just gorgeous. Gorgeous you. Great dress and headband. You are too sweet. And I totally agree -- I will never get enough of sparkles and vehemently argue with anyone who says that they're passe. Love how you paired the glitz with the relatively simple high-waisted skirt! ohhh i love sequins. i wish i had something sparkly to wear every day of the week! this is so gorgeous on you, it looks like a dress! That sequin top is just gorgeous on you and I love the headband. You are too beautiful! BTW, I'm hosting a Valentine's Day contest at my blog and I would love it if you entered! Please check back at my blog for more details! As for the pictures, they are great and you look exquisite! I love sequins!!! Really lovely blog! oh and btw lady, I added you to my favorite blogs list. That top is so cute! I love these pictures. Sequins are so exciting, I love the way you're wearing them, your outfit looks amazing! Thank ever so much for visiting me !!! I hope you have enjoyed my blog, thanks so much for adding me to your favourites and I look forward to keep in touch with you. 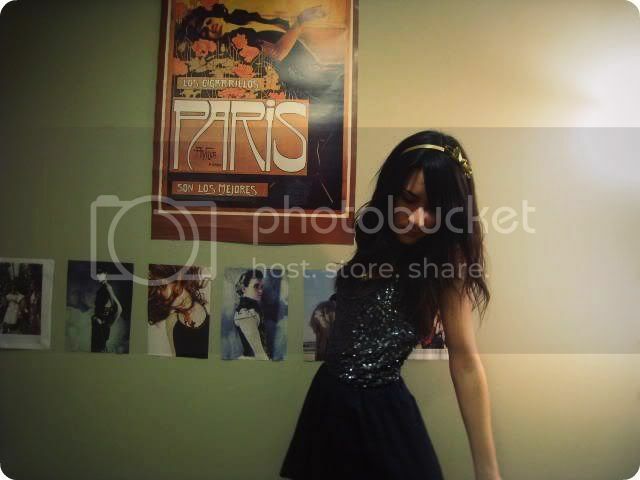 the dress is really pretty, and I have to say that I really like your room - the posters are so cool. i adore the sequins, fantastic look! oooh i am likeing ur dress alot girl!! and i really enjoy ur blog and the header is tres tres cool! Love the sparkles and the art nouveau poster in the background is tres cool. woh, thought this was just one dress. so so cute. oh my gosh that dress!!! my bad... it is a top and skirt i see now. they look seamless together, literally!